"Classic Piccata reaches a new peak with the marvelous addition of mushrooms! This is a favorite in our family. Serve with rice and a green salad if desired." In a shallow dish or bowl, mix together flour, salt and paprika. In a separate dish or bowl, mix together egg and milk. Dip chicken pieces in egg mixture, then in seasoned flour. In a large skillet, heat butter or margarine over medium-high heat. Saute chicken pieces until golden brown. Add mushrooms and onion and saute for 3 to 5 minutes. In a medium bowl combine the broth, wine, lemon juice and cornstarch. Mix together and pour mixture over chicken and mushrooms. Reduce heat to medium low and let chicken mixture simmer for 25 minutes or until chicken is cooked through and juices run clear. Sprinkle with parsley and serve. 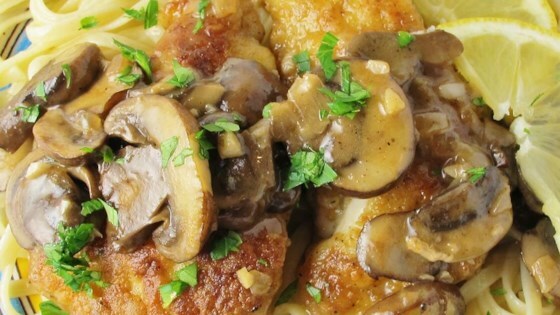 Mushrooms take classic chicken piccata to new heights of flavor. Absolutely delicious! A note, if you decrease the amount of servings, do not change the amount of sauce ingredients, or will cook off all the sauce.